'Marketing' with Metadata - How Metadata Can Increase Exposure and Visibility of Content. OAI-PMH, Z39.50, SRU/SRW, RSS is a well-written and clear 2006 "how to" guide by M. Moffat from the JISC-funded PerX Project about how properly structured metadata can increase the findability of web resources. Ofcom has just published its fourth annual report on trends and developments in the UK's communications market, and if you need to get a full appreciation of who can access what communications services from where, or to understand the demographics of access, this is the place to look. access page for full print version, where the real meat is. On 23 August iParadigms LLC and Blackboard Inc. announced that the have settled their disagreement regarding iParadigms' plagiarism detection patent. Under the settlement, iParadigms has reaffirmed its promise not to assert the patent against Blackboard or the use of Blackboard's SafeAssign anti-plagiarism application. If the settlement involved financial terms of any kind, these have, understandably, not been made public. For (e-learning) patent buffs, the 3/8/2007 8 page Complaint by Blackboard Inc. against iParadigms [300 kB PDF], owners of the TurnItIn system used by the UK's JISC Plagiarism Advisory Service, and helpfully placed on the Internet by im+m, is worth reading in full, if only for the insights it gives into "patent business practice" in the US. Here also for reference is iParadigms' US Patent 7,210,301.
iParadigms, the Claim asserts, has approached Blackboard telling it that Blackboard is infringing patent 7,210,301. Blackboard's complaint seems to be a defensive response to this, and it uses the interesting line of argument in paragraphs 20 - 24 of the Complaint, that by previously joining the Blackboard Developer Network and signing up to its terms under some bespoke terms (which I've been given to understand included a specific promise not to sue Blackboard with any intellectual property related to the iParadigms TurnItIn product*), iParadigms has contractualised an entitlement for Blackboard to use Patent 7,210,301. Blackboard has been expressly licences (sic) to practice Patent 7,210,301. There will be (already is!) is other coverage of this issue on The Nose, and e-Literate, and elsewhere. the loop, we had no meetings and could be extremely productive." Ron Avitzur gives a personal and funny account of his time working at and in, rather than for, Apple developing graphing calculator software. A transcript of the talk, which puts its finger on the way that the rules of the workplace get subverted, but Avitzur's 2004 version of the same events comes pretty close. Hans Rosling, Itiel Dror, and David Cavallo will be keynote speakers at the 2008 ALT Conference: "Rethinking the Digital Divide"
ALT hopes to start taking bookings for the 2008 later this year. The best way to keep in touch with this is by joining the low volume email list from the ALT-C 2008 home page. Meanwhile ALT has just issued a follow up call for expressions of interest in membership of the 2008 Programme Committee [smallish PDF] for which the closing date is 14/9/2007. Finally, to keep in touch with the 2007 ALT conference, you may wish to subscribe temporarily to this RSS feed, which aggregates the feeds from a number of delegates who intend to update their own blogs whilst at the conference. The seemingly impossible is possible - TED and other talks by Hans Rosling. "There are many ways in which a course can be structured and supportive resources presented using a VLE. One example would have been to use the scheme(s) of work as the template for lesson-by-lesson breakdown. The model I chose to adopt and develop was to present the documents that the learners would find important to them such as the course plan, course specification and assessment plan and offer these as the first topic outline for the course (See Figure 1: Important documents). This proved to be a 'eureka' moment. I had been trying to get the students to complete their portfolios since the beginning of the course but they were always quite reluctant to do so and seemed to find any number of issues that appeared more important. When they suddenly had access to the course assessment plan, (see Figure 2) and could now chart their own progress through their own assessment summary sheets, the impact on their interest and enthusiasm was palpable. This certainly was a defining moment as the group developed a growing awareness of the opportunity to take greater control of their learning." Seeing Clive Shepherd's piece about redesigning a logo reminded me of this terrific self-help guide to designing a business identity, from 37 Signals. It has been around for a long time, but it still packs a punch. I put the World Wide Web Consortium's Markup Validator down as 5th in my Top Ten Tools in Jane Hart's recent survey. I was alone in this amongst over 100 other respondents. Maybe this points in part to a general doubt in the e-learning world about the value and relevance of making web content conform to W3C standards. (Fortnightly Mailing tries, but sometimes fails to conform.) According to W3C, the Markup Validator has just been updated "with improved accuracy and performance" and "an automatic cleanup option using HTML Tidy". The latter feature is a particularly useful and time-saving one. 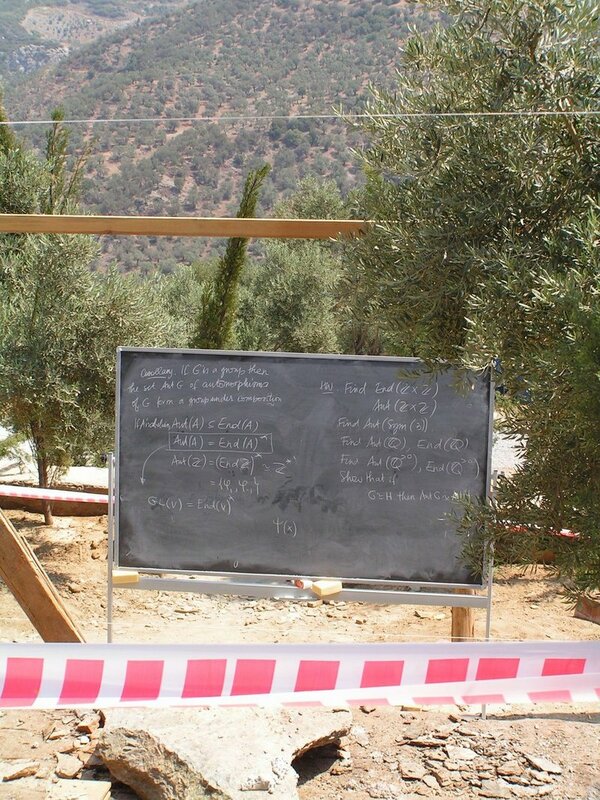 Mathematics summer school closed in Turkey because it involved "education without permission". Petition against the closure. 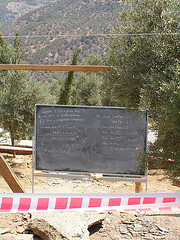 Alexandre Borovik, a Professor of Mathematics at Manchester University whose "Mathematics Under the Microscope" I have referred to previously, reports on the arrest of a blackboard in Turkey in the course of the closure by the authorities of a Mathematical Summer School, held in Sirince, Turkey, for a variety of alleged violations, including, as Borovik's Turkish colleagues told him, for "education without permission". Borovik has set up a petition against the closure.